Are Bears Likely to Harm You? The only native bears in San Diego County are grizzly bears, which were exterminated before 1900. Black bears may be currently reclaiming that space in the local ecology, but the jury is still out on whether black bears will persist in the County. In 1933, 28 black bears were relocated from Yosemite to the San Bernardino Mountains, with another 11 relocated to the San Gabriel Mountains. The population in each area gradually expanded to somewhere between 150 and 500 in each region, the maximum carrying capacity. For many years, the bears stayed north of I-10, with only an occasional individual being sighted south of I-10. In the past few years, there have been an increased number of sightings of black bears south of I-10, including ~10 in San Diego County 30-70 miles south of I-10. One possible explanation for the sightings in San Diego County is that somewhere around 1997, a population south of I-10 became established in the San Jacinto and perhaps the Santa Rosa Mountains. From this base, black bears are now frequently sighted in San Diego County. However, this explanation is by no means yet a clear fact. It will require at least several more years to establish whether there is an established population south of I-10, or if the observed bears were transients caused by some infrequent event in the population north of I-10. The data are given below. There is no doubt that the number of sightings has increased significantly, especially since the 10 sightings in 1996-2000 have all occurred in the last two out of the last five years in that interval. However, the number of sightings does not necessarily equal the number of bears, and it is dangerous to extrapolate the data from only two years far into the future. For example, if only one of a population of 10 bears is female, that population is not guaranteed to survive. Also, keep in mind the unsuccessful attempt to establish a breeding population in San Diego County in 1917-1919. If the population keep growing, and the numbers south of I-10 grow to the hundreds, then it is likely that the population has become established. Despite the fear that bears cause in many people, bears are a natural part of the ecology, and extremely unlikely to harm you. The bears in the San Gabriel Mountains are rarely seen, and rarely bother people. 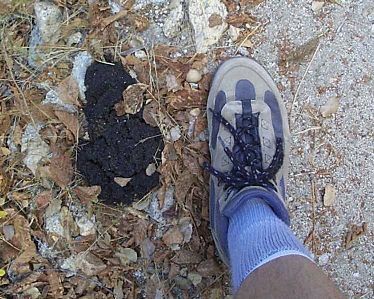 I have hiked well over 1000 miles there and never seen a bear, although I have seen plenty of bear poop along the trail. See If You Encounter a Bear for advice if you are lucky enough to see a bear up close. All too often, panicked people shoot a bear or cause its destruction by complaining about it. In 1998, 151 bears were killed due to complaints about them being "problem bears". In Lake Tahoe, a Bear Preservation League (at (530) 525-PAWS) was organized to teach humans how to get along with bears, to prevent unnecessary bear deaths. In 1917-1919, a group of servicemen introduced bears to the Cuyamaca Mountains and Campo. In 1976, bears were sighted in the Lake Henshaw/Palomar Mountain area and at Buckman Springs. A single bear was sighted in the Agua Tibia Wilderness at Palomar Mountain in 1985, and also in 1987 on the north slope of Palomar Mountain. A female cinnamon colored black bear confirmed near Highway 76, Lake Henshaw, and the San Luis Rey picnic area in 1994. In September 1999, there was a confirmed sighting and photograph of a brown colored black bear at Fry Creek on Palomar Mountain. A single bear took up residence in Heise Park in 1999 (Black Bears in San Diego County). In December 1999, there was a confirmed report of treed bear in Ramona. In January 2000, a brown-colored black bear was sighted in the Palomar Mountain area. In May 2000, two black bears were reported on Palomar Mountain. A 200 pound male black bear was killed in the Ballena Valley nine miles east of Ramona on 5/15/00 at ~ 6 p.m. after it entered David Benson's yard and approached their sheep and pigs. David and his wife Nancy tried to scare it away, but it turned toward them and stood up. David fired a warning shot into the air, to no effect, and then shot the bear in the head. Unreferenced sightings above are from San Diego Natural History Museum's American Black Bear and Sightings. I thank an anonymous reader for comments that significantly improved this page.